The BBC hopes to be a world-beater with Project Canvas, the broadcaster's much-mooted online TV service, by selling the upcoming online platform globally. This is according to Richard Halton, BBC Director of IPTV, who was speaking today at the Westminster eForum. TechRadar was in attendance as Halton outlined his thoughts on the TV service that's all about bringing "broadband and broadcast" together. In his speech, he outlined what the BBC wanted Project Canvas to achieve, explaining: "We're following the likes of Freeview, by creating a platform built on open standards where manufacturers will be free to take our specification and use it to create their own set-top boxes that plug directly into the internet." 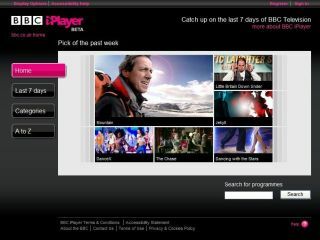 While he explained that "Canvas isn't there to generate profit but as a platform that web services can plug their content into," Halton did admit that the BBC wanted Project Canvas to be a worldwide solution for web TV, saying: "Canvas has to be a standard that can be recognised and sold around the globe. "There needs to be a simple piece of logic for our users – ie, you need this sort of internet connection [to use the device]." Somewhat confusingly, however, he did admit that "the basis of the canvas specification will be the existing DVBT spec" which is mainly used in Europe, Australia and parts of Africa (not America). So the BBC may need to re-think its strategy if it wants to truly dominate the world's online video content. Also in the speech, Halton remarked that an SDK (software development kit) will be available for the service by the middle of next year if all goes well: "The sooner we can get the platform through the regulatory process the better, as the SDK needs to be available by next summer. But this is a flow down from the regulatory process." This would make sense as it would coincide with the launch of Freeview HD in the UK. He also singled out Freeview as the main inspiration for Project Canvas, saying: "We need an environment that is flexible enough. With Freeview it is new services that drive box sales and we want to take a similar model."